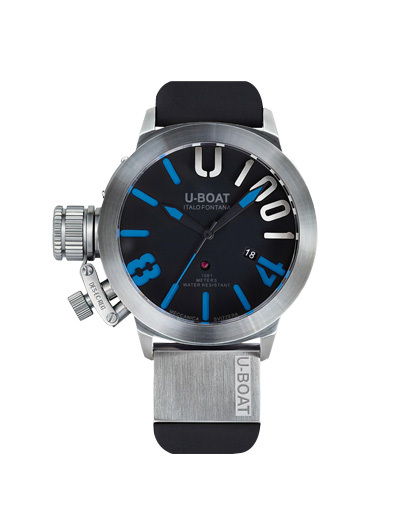 MOVEMENT: automatic mechanical, modified and personalized to U-Boat specifications for stem position at 9 o’clock. Height: 4,60 mm. 25 jewels. Power reserve: 40 hours. FUNCTIONS: hours, minutes, seconds, date at 4 o’clock. Frequency: 28.800 vibrations per hour, 4 Hz. CASE: in steel. Distinguishing crown on the left side, with a special protective device (protected as a Trade Mark) and helium escape valve, serial number engraved on a steel plate, set on the left hand side of the case. Diameter: 47 mm. BACK: screwed in, limited edition 1001 units, serial numbering engraved in bas-relief. 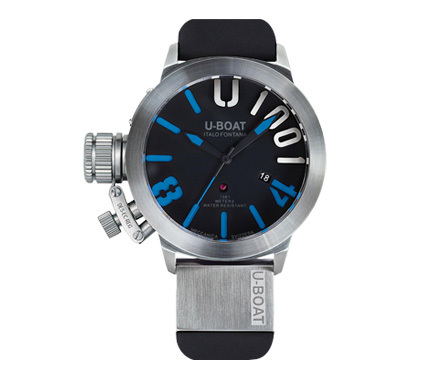 “Skeleton” personalized U-Boat rotor. 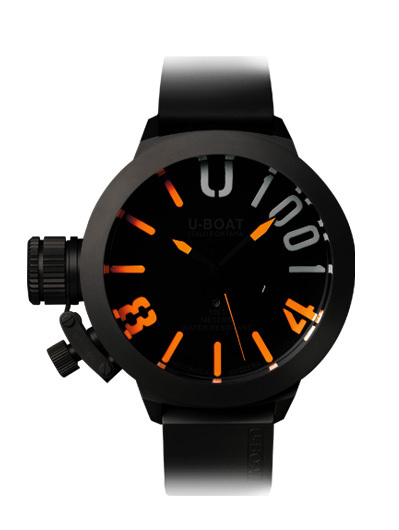 DIAL: two superimposed dials, one treated with superluminova orange or blue added pigments, and the other one cut, treated with composed opaque black pigments. Arabic numerals, superluminova luminous hands. U1001 writing in high relief. CRYSTAL: high quality sapphire, scratchproof, 9 mm thick. WATER RESISTANCE: 1001 mt, 100 ATM. STRAP: black, rubber hypoallergenic with plate in steel and subsequent IPB coating, deployante buckle. Width: 23/22 mm. Fastened to the case with screws. The model can be assembled, on request, with flat regular sapphire glass.